When Verizon notified me that they would delete my photos, I was surprised because I didn’t remember storing them there. It turns out thatÂ Verizon also offersÂ a photo service: for one TB of storage, it’s $119.88 a year; prints are 19 cents each plus shipping. 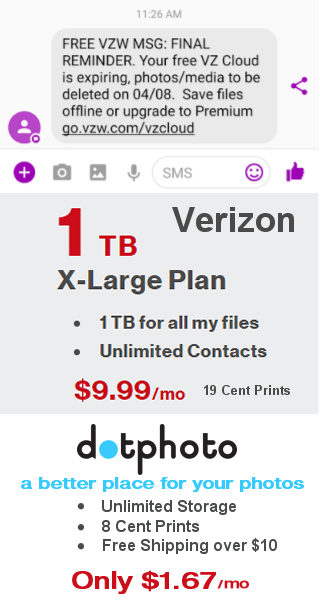 By comparison,Â dotphoto offers unlimited storage, 8 cent prints and free shipping on orders over $10Â — and more services all the time for just $1.67 a month. Tap the Download down-arrow button. Your photos will download as a zip file.